This year, the image for our program cover was chosen for its engaging graphic composition, and its content. 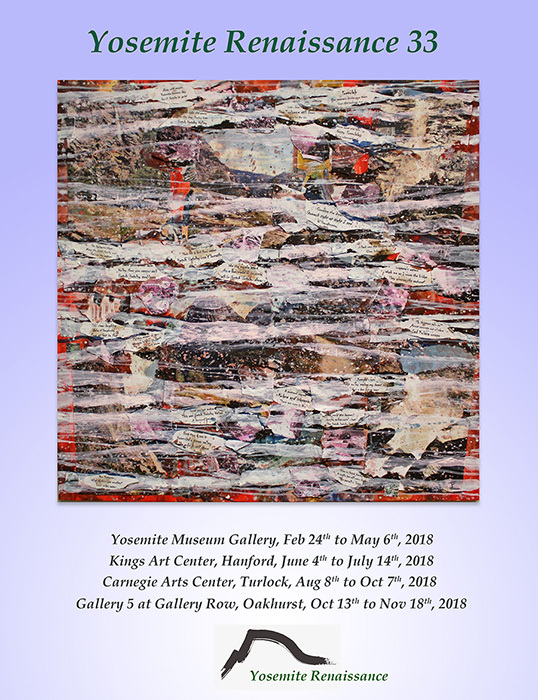 The piece combines images and text related to the flooding of the Hetch Hetchy Valley, for the point of view of someone directly influenced by the event. "My parents, both artists in their own right, took a photograph of me propped against a pine tree in Yosemite Valley when I was six months old. 64 years later this special place is still stimulating my senses in a multitude of ways. It invites me to follow its paths and explore its vast wonders. It asks me to share its beauty with my family and friends. It tempts me to photograph its plunging waterfalls and towering cliffs. And it inspires me to draw and write and paint and create, something I've been doing my whole life. For me drawings and words and paintings are little windows to show others what I see and hear and feel, and to celebrate inspiration. Without the inspiration of places like Yosemite, for me, there would be no art. Along with the sky, moon and clouds, equine forms, rocks and moving water, and the contrasts and movement of nature, Yosemite and the Sierra Nevada continue to be an enduring source of inspiration. Yet as beautiful and precious as these sources of inspiration are, sometimes inspiration comes in a different form. Sometimes it is the exact opposite, a need to express the pain of grief, the despair of loss, the wretched sacrifice of perfection. Many years after the photograph under the pine tree was taken, I drove into a forgotten corner of Yosemite National Park. What I saw when I steered around a particular bend in the road has left an ache in my heart that has never gone away. A magnificent granite valley, astonishingly similar to Yosemite Valley, lay before me. But this perfect beauty had been damaged beyond belief. I couldn’t imagine how we as a people could let this happen. Although the upper reaches of the valley were pristine and breathtaking, the lower half was covered with the fluctuating waters of a reservoir which left a disgusting “bath-tub” ring on the valley’s granite cliffs. What should have been a lovely lake was instead an abomination. The water was contained by an enormous concrete dam which blocked the flow of what was surely a once magnificent the river. This place is Hetch Hetchy, and the dam is the infamous O’Shaughnessy. Over the decades my need to share the abhorrence I feel over the loss of the Hetch Hetchy Valley has been expressed in various ways. There have been the letters written to politicians and media sources, the research into the history of the area, contacting and sharing with others who find the drowning of Hetch Hetchy intolerable, and most importantly, the creation of art. By studying old photographs of Hetch Hetchy Valley before it was flooded, drawings and paintings have been produced and shared and exhibited and given away. Photographs have been taken and displayed and published. Prose and poetry have been written on the subject, and partnered with those photographs and drawings and paintings."